MORE than 700 runners passed through the historic arch of Oak Park as the fifth annual Charlie Curran Memorial Run hit record numbers. 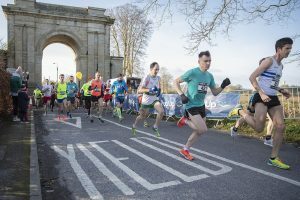 The event on the last Sunday in January was another super sell-out with runners and walkers enjoying the event’s new five-mile distance. Forty volunteers helped out on the day, including the Order of Malta and Civil Defence. Particularly pleasing for organisers was the feedback from Oak Park Road residents, who were happy to see disruption kept to a minimum. Race participants also once again enjoyed a stellar spread of refreshments in Carlow Hurling Club after the run. The start of the 2019 Charlie Curran memoreal 5k run. Such was the success of this year’s event that Charlie Jnr revealed the new five-mile distance is here to stay. He also hopes the event could push for full road closures this year. “There was very little traffic, but if it affects one person it’s one person too many,” he said. A feature of the race is the large number of visiting runners it gets from outside the county. Charlie Jnr put the figure of ‘tourist runners’ at about 70% of the turnout. A young girl from Cork, Lily O’Dea, who suffers from global development delay and is wheelchair bound was given the number 1 race number for the event. Charlie Jnr was pleased that the run started and finished from the historic arch at Oak Park. Stephen Conroy of Celbridge AC was the first man over the line in a time of 26 minutes, while James McAssey of St Laurence O’Toole’s finished just seconds behind. Midlands runner Mary Steed was first woman home in a fantastic time of 33 minutes, while Geraldine Hendricken of St Laurence O’Toole’s was the first Carlow woman to pass the finish line a minute later. The event is held in memory of Charlie Curran of Dereen Heights and this year’s proceeds are going to the Carlow/Kilkenny Homecare Team and Billy’s World. A final tally is not yet known, but it’s hoped that thousands will be given to each charity.